The holiday winds are blowing early this year, but we are prepared with many, many Thanksgiving and Christmas designs good for gift giving or gift stitching. We also have any number of exciting projects to stitch for yourself. Designers have been extremely busy this season. We have a selection of new design photos at the end of this newsletter. We will be closed on Thanksgiving Day, but on Friday, November 28, we are planning an After Thanksgiving Sale with 10% off your entire purchase. This covers everything in the shop. Happy Thanksgiving and we will see you on November 28 – 10 until 5:30. You are cordially invited to our Annual Christmas Open House on Saturday, December 6, from 10-4. Come enjoy hot punch and cookies and peruse holiday offerings. Remember – we have gift certificates in any amount. 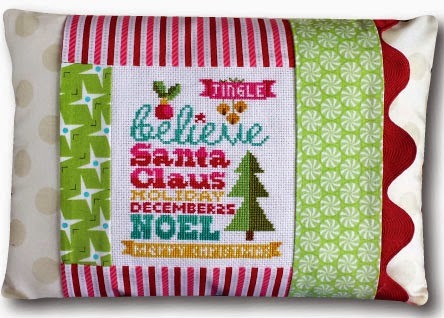 Lizzie Kate has a last minute Christmas kit that’s always popular. 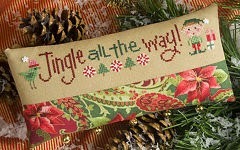 This year it is Jingle All The Way; a small pillow kit stitched on Lugana fabric with beautiful finishing fabric, 2 snowflake buttons and 5 golden jingle bells. Very cute! 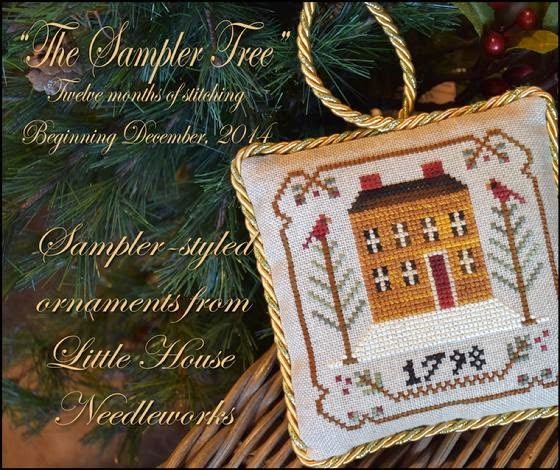 Little House Needleworks is beginning a 12-part ornament collection in December 2014. Called “The Sampler Tree,” these once a month ornaments will be sampler-styled. We have a sign up list, if you are interested in this darling series. Following are new goodies from Kelmscott Designs: beautiful Snowflake Needle Minder is white on dark navy background, Pere Noel Minder placed on hunter green background, and Angel mother of pearl thread winders which come 2 to a package. Any or all of these accessories would make special gifts for stitching friends. 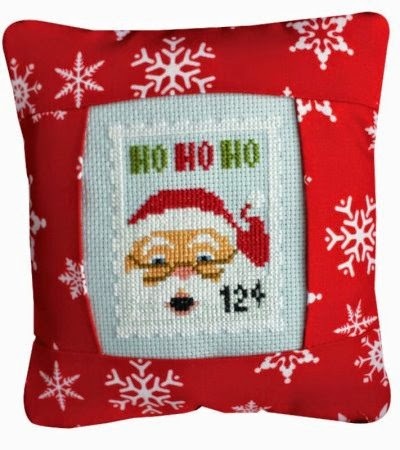 Pine Mountain Designs has two new Stamp Series pillows: 11 cent stamp is a Thanksgiving design and the final stamp in the series is the 12 cent Santa. Just stitch the design and slip it into the pre-sewn pillow. Both of these stamps are too cute! 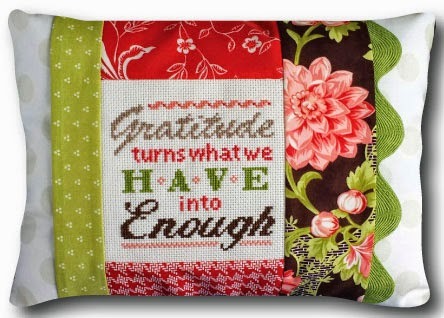 Two larger pillows also celebrate the holidays: Gratitude is Enough for Thanksgiving and Believe in Christmas. 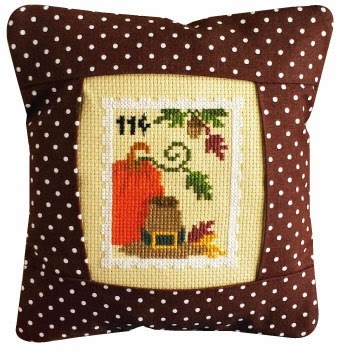 In each case, stitch the design and slip over a polka dot pillow form.